I heard that the default size for pst-files is 20 GB but also that there must be a registry value that allows to increase the maximum up to approximately 4PB (4096TB). How do I increase the maximum file size of an UNICODE pst file? 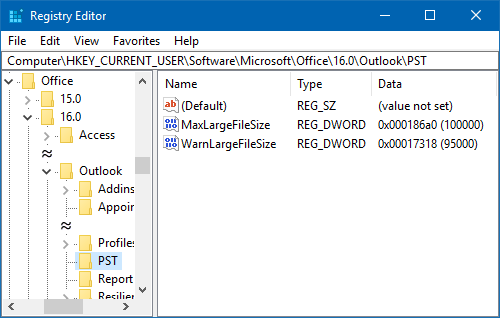 In Outlook 2003 and Outlook 2007, the maximum size of a Unicode pst-file has indeed been limited to 20GB. In Outlook 2010 and 2013, this limit has been set to 50GB. You can increase (but also decrease) this limit via the Registry or via Group Policies. Note: This tip does not apply to pst-files who are in the Outlook 97-2002 format (ANSI formatted pst-files). Above the maximum size of a pst-file has been set to 100GB with a warning at 95GB. Not comfortable editing the Registry? You can then use Group Policies as well even when you are on a home computer. For instructions on how to use Group Policies seethis guide.